The above products are recommended for installation or mounting of the DriveTite Interior Kit - VR298. We recommend you purchase our 5″ long T-30 driver in order to tension the Tensioning Screw more easily than using a standard length T-30 driver. These components are crafted from marine-grade 316 stainless steel and aluminum for lasting beauty and strength. 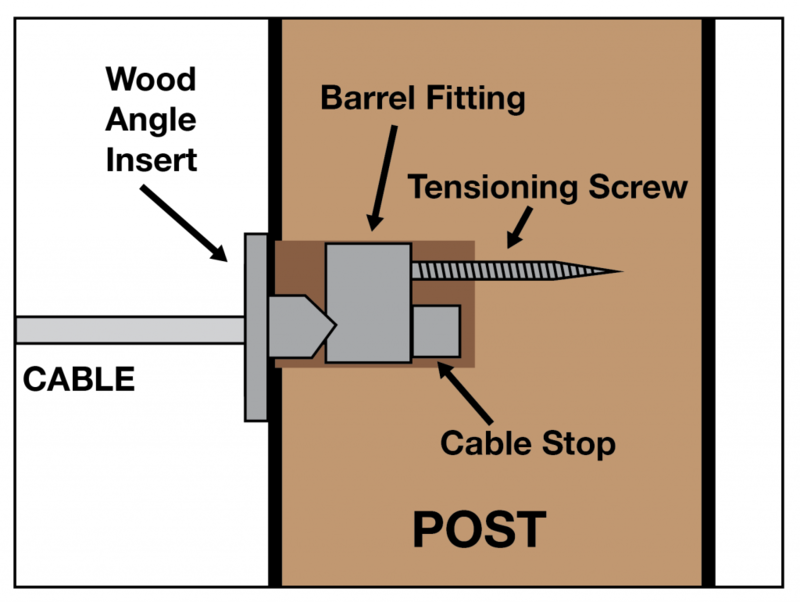 We recommend putting a cable every 3 1/8″, we’ve found that this spacing (when combined with an intermediate post placed every 4 feet), allows for minimal cable deflection, so that you stay within the common 4″ sphere rule for code. If your overall system height is 36″ tall, typically a 10 pack for each post is required (depending on your handrail setup, it might be less). For 39″ systems purchase a 11 pack, and for 42″ systems purchase a 12 pack. Can the DriveTite fittings be used with 1/8″ cable? Unfortunately no, the fittings are designed to only work with 5/32″ cable. We recommend using out cable since we’ve obviously tested it to ensure that it will work. Please explain installation of the DriveTite (CRIMPED) Kit. It obviously is different than the uncrimped, but your video shows only the uncrimped! The Crimped version of DriveTite uses a Cable Stop that is crimped onto the cable rather than the Cable Wedge, which slides over the cable and is compressed into the Barrel Fitting. In general, we suggest getting the uncrimped version unless you’re already doing a lot of crimping for a run of cable with metal posts. Please let us know if there’s anything else we can help you with! Can I buy just the cable stops seperate? You can buy just the cable stops at https://www.stairsupplies.com/product/cable-stop/. How much tension can each DriveTite lag handle? Thanks for the question Robert. We’ve tested DriveTite in house and it handled up to 1000 pounds.